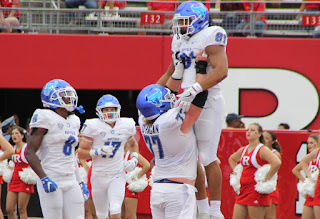 PISCATAWAY, N.J. -- It was a historic day for the University at Buffalo football program as the Bulls beat Rutgers, 42-13, at HighPoint.com Stadium on Saturday for their first ever win over a team from the Big 10 Conference. Buffalo improved to 4-0 on the season for the first time since the 1981 campaign. "It is nice to see that the work that these guys have done and the tough times that the upperclassmen have been through, to see them start having it pay off for them," head coach Lance Leipold said. "We have a long way to go this season, but I'm proud of where they are and a huge challenge at home next week against Army." The Bulls jumped out to a 35-6 first-half lead and never looked back. And, once again, they did so with a slew of big offense plays. Tyree Jackson hit Anthony Johnson in stride for a 42-yard touchdown, midway through the first quarter, to not only open the Bulls' scoring, but the scoring floodgates. Jaret Patterson followed with a 42-yard touchdown run, on the Bulls' next possession, to extend the Buffalo lead to 14-3. Patterson had the best game of his young career, as the freshman running back finished with 104 yards and two touchdowns on only 14 carries. After a Rutgers field goal cut the UB lead to 14-6, early in the second quarter, Jackson eluded the pass rush, rolled to his right and threw a frozen rope to Johnson for a 59-yard gain, setting up a 1-yard touchdown plunge by Kevin Marks to extend the lead to 21-6. The Bulls weren't done scoring. On a third down near midfield, Jackson hit a streaking Charlie Jones for a 53-yard touchdown right down the seam. Jackson then hit Tyler Mabry with a 9-yard touchdown pass, late in the second quarter, to give the Bulls a 35-6 lead at the half. Rutgers never threatened in the second half. Patterson put the exclamation point on the win with a 4-yard touchdown run, with 3:34 left, to make the score 42-13. It was another big game for Jackson. The junior signal-caller threw for 263 yards and three touchdowns in the game. He now has 15 touchdown passes on the season and has thrown for at least three scores in every game this year. "Tyree is an outstanding quarterback," Johnson said. "He's always going to make big plays for us and get the ball to us. He's always going to do his job and help us out. We expect big things from him every game." Johnson had 101 yards receiving and two touchdowns on only two catches. K.J. Osborn and Tyler Mabry each had three catches for the Bulls. "Anthony is a great player," Jackson said. "He's always making plays, that's just what he does. To have a guy like that on your team is definitely a blessing and it just sparks the offense with big plays. He's going to continue to make plays for us. Buffalo had its best day rushing the ball this season. The Bulls ran for 182 yards on the day, led by Patterson's 104 yards. Marks had 63 yards rushing on 12 touches, including a 37-yard scamper. Defensively, Khalil Hodge had a season-high 15 tackles to lead all players. Joey Banks added eight stops. The Bulls had eight tackles for loss in the game. None was bigger than Chuck Harris's sack on fourth down, with Rutgers on the UB 6-yard line and trailing 35-13, early in the fourth quarter. The Bulls improved to 4-0 on the season and have won two non-conference road games for the first time in school history. Buffalo will look to improve to 5-0 next Saturday when it hosts Army at UB Stadium at noon.